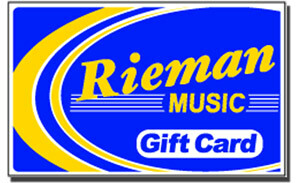 Give the gift of music and take the guesswork out, with a gift card from Rieman Music! This item ships free of shipping charges to the primary shipping address on your account. If you wish to mail it directly to the recipient, simply enter delivery information in the ORDER NOTES box during checkout. Cards are valid for in-store purchases only, good at any of our 6 locations throughout Iowa. Full terms and conditions of Rieman Music gift cards are stated on the return policy page of this web site. Gift cards are usually shipped within 1 to 2 business days and should arrive within 3 to 8 days.